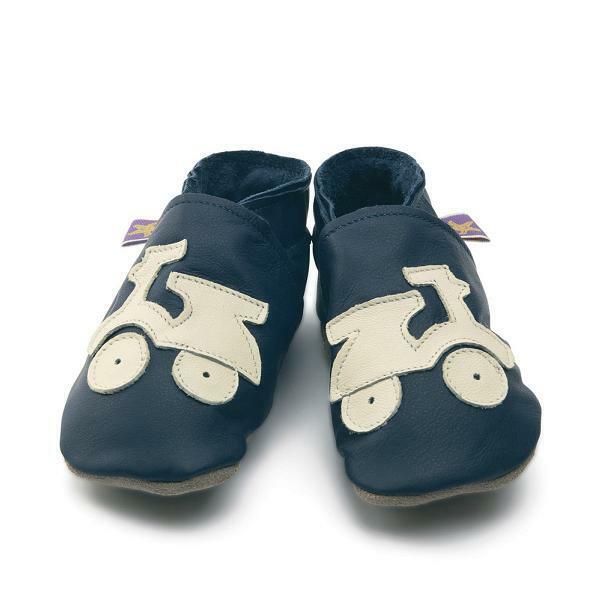 The soft leather babay shoes come in a cream and navy scooter design. They have an anti-slip sole ideal on several surfaces and are made from genuine soft leather. Children can wear these shoes all around the house, at nursery or shoe them off on a playdate! - Anti-slip sole great on all surfaces around the house! - Hand or machine wash (with similar/same colours), using a mild detergent at a low temperature. - Ultra-fast drying (air dry). - Wipe the leather with a cloth soaked in milk, it has a renewing effect on leather..
- To maintain the anti-slip sole, simply brush the suede to remove all the dirt & crumbs making it smooth again. Starchild produce the famous soft sole leather baby shoes and slippers. Starchild products protect little feet allowing them to breathe and grow naturally. The natural soft upper leather has a durable non-slip sueded sole and is ideal for bouncing, crawling and early walking, great on tiled or wooden floors. Each pair is lovingly hand made in England in a traditional shoe factory. The Starchild leather slippers are made in respect of the environment. The colours used in the Starchild Slippers are non-toxic. The elasticated ankle keeps little ones socks on and cannot be easily kicked off, ensuring that the shoe stays on, no more lost or odd pairs with the Starchild range. Starchild baby shoes & toddler slippers are recommended by mums and pediatricians.